​We are super excited to feature the great artisan, Isaac(@pigeontreecrafting) on our blog. Isaac kindly has been involved with our projects. He created the beautiful leather patch for THE DENIM HOUND / KOJIMA GENES x SF collaborated denim that will be coming out shortly through our crowdfunding campaign. Also, we are planning something exciting with Isaac so stay tuned! Now, let's share his fantastic story!! ​I’ve always had an interest in Men’s Fashion, and for the past 6-7 years I’ve really moved away from labels that have high costs without the value to back them up. I’ve found that Made in USA is largely synonymous with being made well, and that’s one of the aspects that really sparked my interest in the Raw Denim community. “Denimheads” are individuals that value quality above all- whether it’s the denim itself, or the accessories and lifestyle that go with it. My growing appreciation for this community of craftsmen and supporters motivated me to find a way to contribute. Enter the “Quick Release Buckle,” which deserves a lot of credit for bringing my craft to where it is today. When I first saw this buckle, I thought it was the coolest thing ever! I tracked down the wholesaler for the buckles after seeing them in person in England, and decided to make some belts for myself and my close friends. It didn’t take long for it to occur to me that I could bring this unique product to the US market and perhaps bring in some side-income. Little did I know that within 3 months this would be my full time job. 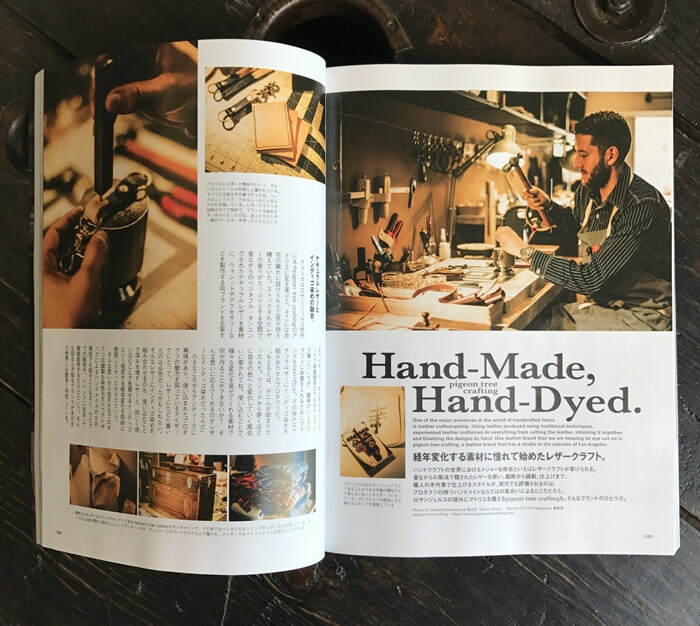 Isaac was featured on a leading Japanese men's fashion magazine "CLUTCH". 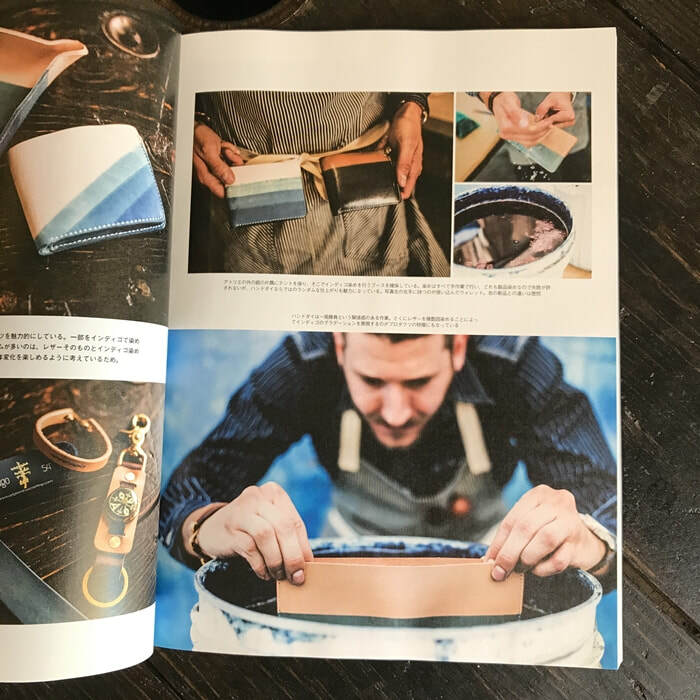 ​When I have a passion for something, I want to learn as much as I can about it, which lead to me really diving into the art of leather crafting: I bought books, watched videos, joined forums, etc. 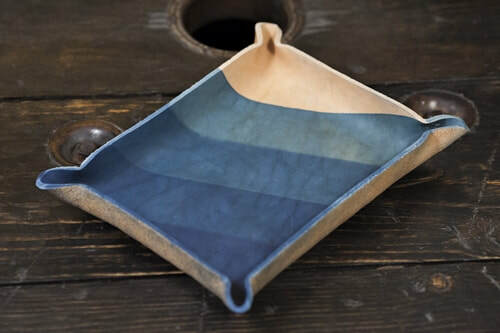 I was also able to draw from childhood memories of my Mom making wet-formed leather pouches, which we can now thank for the leather catchall trays that I make today. ​Of course, then we have the use of Indigo, which is very prominent in all of my products. Indigo is the oldest dye in the world; it’s a natural dye that comes from the Indigofera flower, and even though mostly synthetic versions are used today, it is the backbone of the denim industry. What I love most about Indigo and leather, is the commonality that they share. Indigo garments are known for their fading nature, like raw denim that starts off with a deep saturation, but over time, “crocks” or fades off, creating a garment that is totally unique to the user. 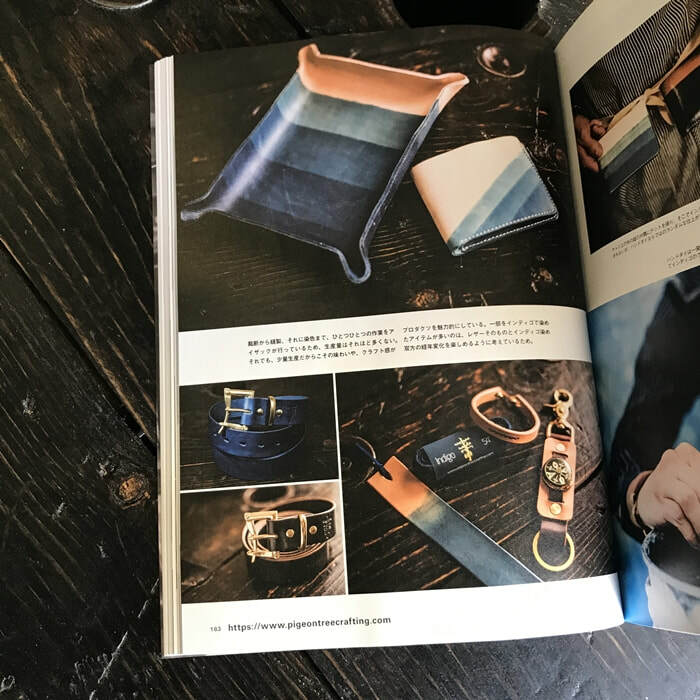 The difference is that indigo can age with the leather, and this has taken a couple of years to get right, but with a deep enough indigo hue and the right care, indigo leather can age to a richer and deeper blue than it began. 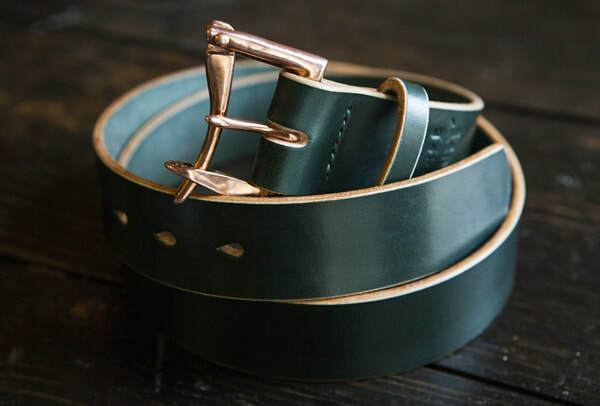 ​The type of leather that I use- natural vegetable tanned leather, is like a blank canvas in a way, as it’s used the leather reacts to the oils in your skin, the sun in the sky, the indigo from your pants, and all of these things create what’s called “patina”. Give the same natural wallet or pair of raw denim jeans to two people, and a year down the road each will have developed its own unique characteristics. While sitting on my patio, I tried to come up with a brand name and logo that was fun, memorable, and had a deeper meaning behind it. I was struggling to envision anything, when there from my patio, I spotted a sight all too familiar here in Los Angeles, a telephone pole filled with pigeons. It occurred to me that you never see a pigeon in a tree, they’re always on telephone poles, or buildings. I immediately imagined the logo and went to work in Photoshop. The logo that I created on that day is the same logo I use today. The meaning? Both the telephone pole and the pigeon are messengers, and I would like to think that my products will help my customers tell their stories. I like to think that Pigeon Tree Crafting is more than just a leather brand. I make products for you to wear, as well as products for your home. Viewing my website or walking into my booth at a craft fair should feel like the equivalent of walking into a cool and totally unique boutique; you’ll find a variation of goods such as shoelaces, keychains, catchall trays, coasters, bandanas, t-shirts, vintage oddities, belts, wallets, bags, bracelets, necklaces, etc. It’s basically a snapshot of my fashion sense, because the goods that I make are inspired by what I feel represents me as a whole. Since starting Pigeon Tree Crating I’ve come out with dozens of belt combinations with limited edition leathers and buckle finishes that the foundry had never even made before, and now I’m working with the foundry to create a variation of the quick release belt that I’m very excited about. In addition to more belt variations, I have a new wallet design coming soon; I’ve been using basically the same bifold for the past two years as a canvas for different indigo dip-dye styles, so releasing a brand new design has me very excited. 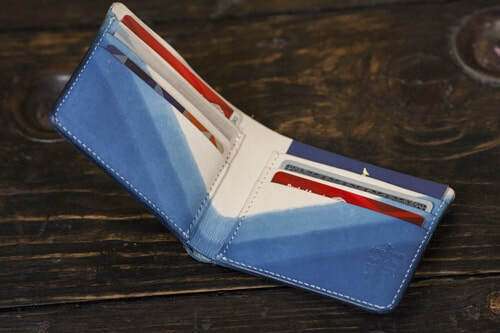 The wallet will be a variation on the mid-wallet, and it too will receive a slew of indigo dye styles to compliment its design. I’ve also begun talks with a Japanese manufacturer about having some clothing made with my designs under the Pigeon Tree Crafting brand.